One of the biggest challenges in natural language processing (NLP) is the shortage of training data. Because NLP is a diversified field with many distinct tasks, most task-specific datasets contain only a few thousand or a few hundred thousand human-labeled training examples. However, modern deep learning-based NLP models see benefits from much larger amounts of data, improving when trained on millions, or billions, of annotated training examples. To help close this gap in data, researchers have developed a variety of techniques for training general purpose language representation models using the enormous amount of unannotated text on the web (known as pre-training). The pre-trained model can then be fine-tuned on small-data NLP tasks like question answering and sentiment analysis, resulting in substantial accuracy improvements compared to training on these datasets from scratch. This week, we open sourced a new technique for NLP pre-training called Bidirectional Encoder Representations from Transformers, or BERT. With this release, anyone in the world can train their own state-of-the-art question answering system (or a variety of other models) in about 30 minutes on a single Cloud TPU, or in a few hours using a single GPU. The release includes source code built on top of TensorFlow and a number of pre-trained language representation models. 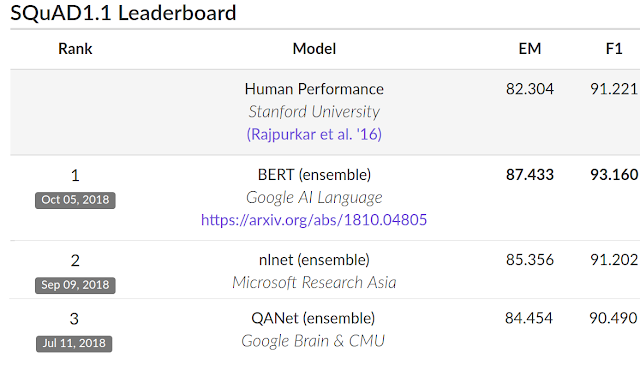 In our associated paper, we demonstrate state-of-the-art results on 11 NLP tasks, including the very competitive Stanford Question Answering Dataset (SQuAD v1.1). BERT builds upon recent work in pre-training contextual representations — including Semi-supervised Sequence Learning, Generative Pre-Training, ELMo, and ULMFit. However, unlike these previous models, BERT is the first deeply bidirectional, unsupervised language representation, pre-trained using only a plain text corpus (in this case, Wikipedia). Why does this matter? Pre-trained representations can either be context-free or contextual, and contextual representations can further be unidirectional or bidirectional. Context-free models such as word2vec or GloVe generate a single word embedding representation for each word in the vocabulary. For example, the word “bank” would have the same context-free representation in “bank account” and “bank of the river.” Contextual models instead generate a representation of each word that is based on the other words in the sentence. For example, in the sentence “I accessed the bank account,” a unidirectional contextual model would represent “bank” based on “I accessed the” but not “account.” However, BERT represents “bank” using both its previous and next context — “I accessed the ... account” — starting from the very bottom of a deep neural network, making it deeply bidirectional. BERT is deeply bidirectional, OpenAI GPT is unidirectional, and ELMo is shallowly bidirectional. If bidirectionality is so powerful, why hasn’t it been done before? To understand why, consider that unidirectional models are efficiently trained by predicting each word conditioned on the previous words in the sentence. However, it is not possible to train bidirectional models by simply conditioning each word on its previous and next words, since this would allow the word that’s being predicted to indirectly “see itself” in a multi-layer model. While this idea has been around for a very long time, BERT is the first time it was successfully used to pre-train a deep neural network. Everything that we’ve described so far might seem fairly straightforward, so what’s the missing piece that made it work so well? Cloud TPUs. Cloud TPUs gave us the freedom to quickly experiment, debug, and tweak our models, which was critical in allowing us to move beyond existing pre-training techniques. The Transformer model architecture, developed by researchers at Google in 2017, also gave us the foundation we needed to make BERT successful. The Transformer is implemented in our open source release, as well as the tensor2tensor library. The models that we are releasing can be fine-tuned on a wide variety of NLP tasks in a few hours or less. The open source release also includes code to run pre-training, although we believe the majority of NLP researchers who use BERT will never need to pre-train their own models from scratch. The BERT models that we are releasing today are English-only, but we hope to release models which have been pre-trained on a variety of languages in the near future. You can also read our paper "BERT: Pre-training of Deep Bidirectional Transformers for Language Understanding" for more details.